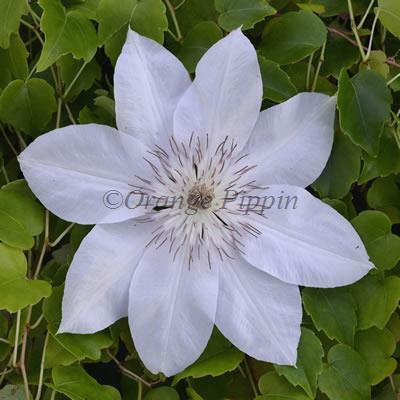 Clematis 'Henryi' is very lovely with its large, creamy-white flowers with dark-chocolate tipped centres produced to stunning effect from June to September. This fast growing, non evergreen climber can be grown against a wall, fence or trellis. To encourage flowers to cover the whole plant, make sure the stems are evenly spaced within the trellis. Clematis 'Henryi' was raised by Isaac Anderson-Henry of Edinburgh, Scotland.